This is a hauntingly moving memoir of the relationship between a cadaver named Eve and the first-year medical student who cuts her open.Christine Montross was a nervous first-year medical student, standing outside the anatomy lab on her first day of class, preparing herself for what was to come. Entering a room with stainless-steel tables topped by corpses in body bags is shocking no matter how long you've prepared yourself, but a strange thing happened when Montross met her cadaver. Instead of being disgusted by her, she was utterly intrigued-intrigued by the person the woman once was, humbled by the sacrifice she had made in donating her body to science, and fascinated by the strange, unsettling beauty of the human form. They called her Eve. This is the story of Montross and Eve-the student and the subject-and the surprising relationship that grew between them.Body of Work is a mesmerizing, rarely seen glimpse into the day-to-day life of a medical student-yet one that follows naturally in the footsteps of recent highly successful literary renderings of the mysteries of medicine, such as Atul Gawande's Complications: A Surgeon's Notes on an Imperfect Science. Christine Montross was a poet long before she became a doctor, and she brings an uncommon perspective to the emotional difficulty of the first year of medical school-the dispiriting task of remaining clinical and detached while in the anatomy lab, and the struggle with the line you've crossed by violating another's body once you leave it.Montross was so affected by her experience with Eve that she undertook to learn more about the history of cadavers and the study of anatomy. She visited an autopsy lab in Ireland and the University of Padua in Italy where Vesalius, a forefather of anatomy, once studied. She learned about body snatchers and grave robbers and anatomists who practiced their work on live criminals. Her disturbing, often entertaining anecdotes enrich this exquisitely crafted memoir, endowing an eerie beauty to the world of a doctor-in-training. 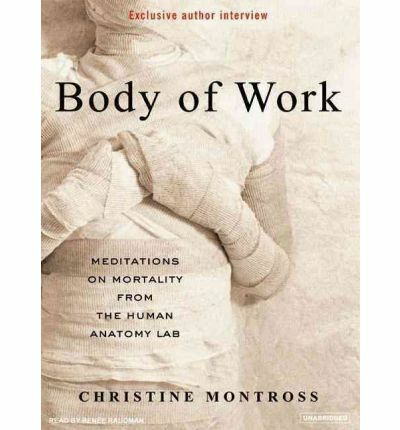 Body of Work is an unforgettable examination of the mysteries of the human body and a remarkable look at our relationship with both the living and the dead. About the Author: CHRISTINE MONTROSS is a resident of psychiatry at Brown University. She received her MFA in poetry from the University of Michigan.